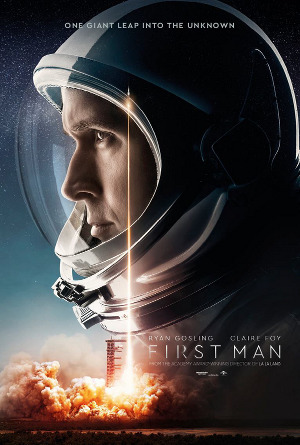 Adapted from the book First Man: The Life of Neil A. Armstrong, director Damien Chazelle's story about the life and career of Neil Armstrong (Ryan Gosling) is a well-made film highlighting various moments of the astronaut's life before the fateful first steps of the moon landing. There's obvious care taken into the look of the film, various historic NASA elements, and capturing Armstrong both at work and with his family. The movie doesn't delve too deep into what made Armstrong tick (there's nothing here you won't find on Wikipedia, for example), and jumps around quite a bit during early segments. That, along with Gosling's stoic performance, does keep the audience at arm's length as I struggled to connect emotionally with the factually accurate tale that still left me a bit cold. First Man isn't focused solely on Armstrong's career at NASA, nor his family life, nor even the series of personal and professional tragedies leading up to walking on the moon. Instead First Man attempts a more comprehensive look than it can comfortably deal with in an already long 141-minute running time. This leaves us with a good film, that I enjoyed, but one I'm unlikely to revisit anytime soon. While Gosling keeps his emotions close to the vest, the burden of carrying the emotional weight of much of the film falls on Claire Foy as Janet Armstrong. Foy steals more than a few scenes, including one used quite a bit in trailers and TV-spots featuring Janet forcing Neil to admit the dangers of his upcoming journey to their children. With us detached from what Armstrong is thinking or feeling, one way in which Chazelle attempts to draw the audience in is the use of hand-held camera for the test and space flights. I've never been a big fan of shaky-cam and these sequences didn't change my opinion or do anything to connect me with Armstrong's historic mission. I also found their use in establishing shots distracting. That said, there are moments when the scope of what is being accomplished are fully realized on film and you want to stand up and cheer (I just wish there were more of them). Despite his low-key introverted performance, which leaves the film with a decided lack of energy in several scenes, Gosling carries the film with a stoic grace. While far from an exciting man, it's obvious there was no one better to command Apollo 11. There are times you can actually feel the film straining to recapture the magic of The Right Stuff or recreate the tension found in Apollo 13 to no avail. First Man may not be in that league, but it does offer an interesting look at an American icon, an engineer never distrustful of science, during a period when the United States wasn't afraid to tackle the unknown and reach for the stars.